Inspired by a Parisian icon. Designed for sophisticated practicality. One of the most recognized landmarks on the planet is celebrated in this magnifique favor, La Tour Eiffel. From its gleaming, chrome surface to the finely etched details to its universal usefulness, this favor brings a distinctly French flair to your event. 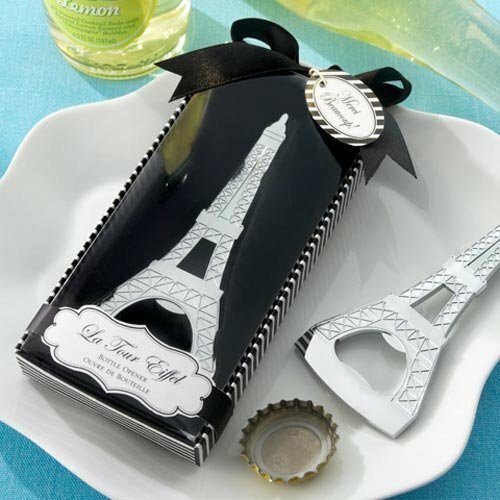 Artistically crafted, alloy Eiffel Tower bottle opener Bottle opener. Displays bottle opener on black velvet in clear-covered gift box with black ribbon and "Merci Beaucoup!" tag. Attachment method of tag may vary.